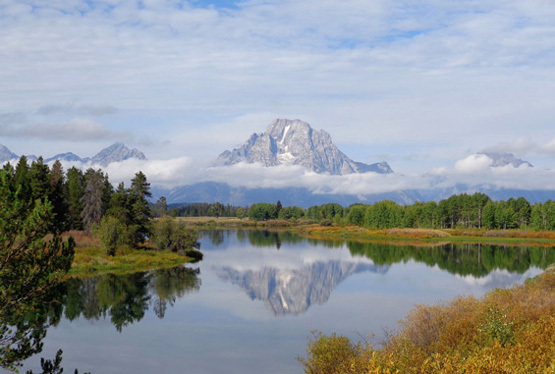 mountain rising steeply above the surrounding area." 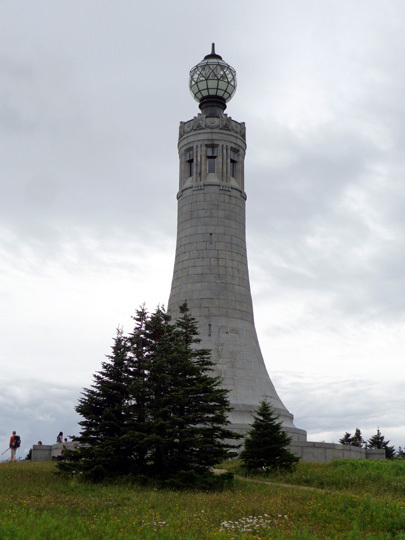 At 3,491 feet, Mount Greylock is the highest peak in Massachusetts. 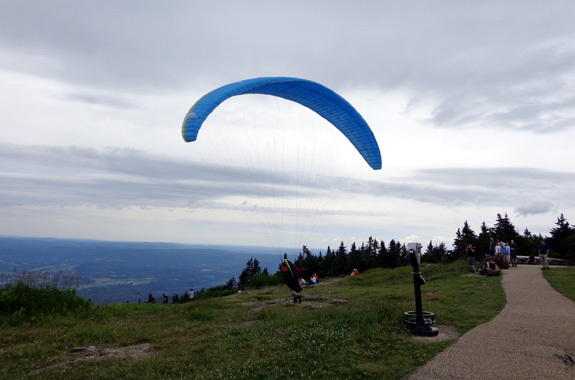 Visitors can drive to the top on the 11-mile-long scenic byway that bisects the Mount Greylock State Reservation north to south and/or they can reach the summit on foot via some of the 50 miles of trail in the park. 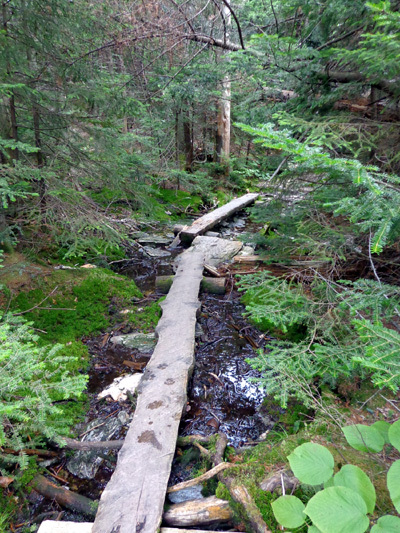 We did both during our Appalachian Trail Adventure in 2005 (see Days 104 and 105 in that journal). Going northbound, I ended a 23-mile day by hiking up the mountain from the south end of the park and met Jim at the top. We drove down the road to our campground in N. Adams. The next morning we drove back up to the summit and I ran/hiked down the mountain to the north end of the park and beyond while doing a 25-mile section of the Trail. Those two days were mostly sunny. 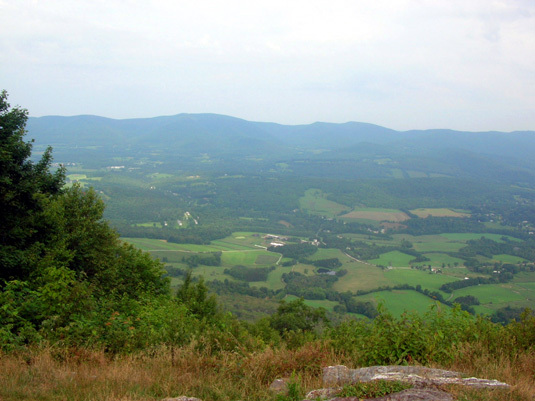 I can still remember the distant views to the Green, White, and Adirondack mountains from the broad summit and how fascinated I was with the sub-alpine environment in the upper half of Greylock. I wanted to experience that again on this trip. 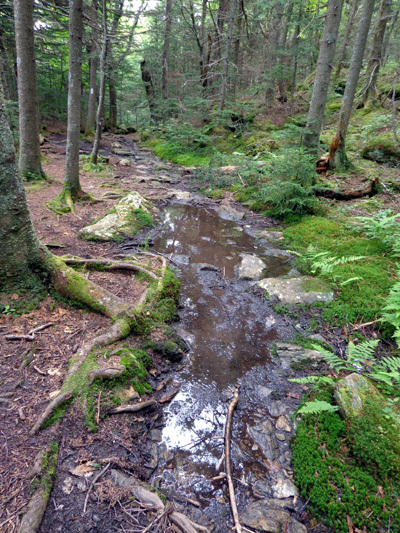 That's how we ended up camping again at the Historic Valley Campground in North Adams, MA. We stayed there one or two nights in 2005 because it was convenient for accessing the A.T. It worked well for us again this time. 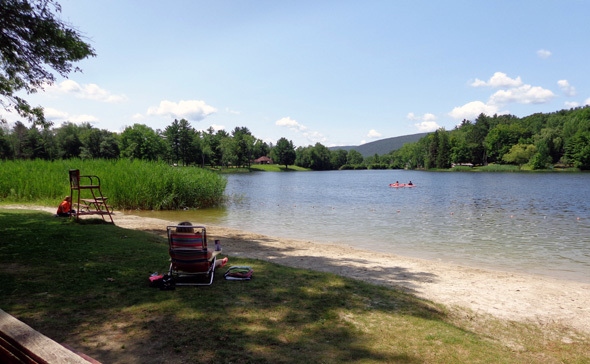 Yesterday we had a short, scenic 51-mile drive on US 7 and MA 8 through western Massachusetts from Prospect Lake CG in North Egremont to Historic Valley CG in North Adams. Fortunately, we were able to get into our new pull-through site much easier at Historic Valley than Jim expected. Because of the problems we had at the last place, we first walked the loop we had to drive with the camper to reach our site to be sure there were no obstacles. We like our large, shaded site. We're on dirt again but no rain is predicted this weekend. The site has 30 amps electricity, water, and sewer for $35/night. There are no discounts other than the monthly rate of $700 for a full hookup site. 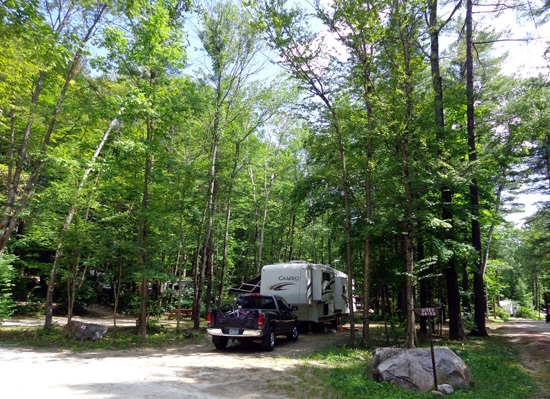 This campground has about 100 sites. About half are occupied by seasonal campers with nicer RVs than those at Prospect Lake. 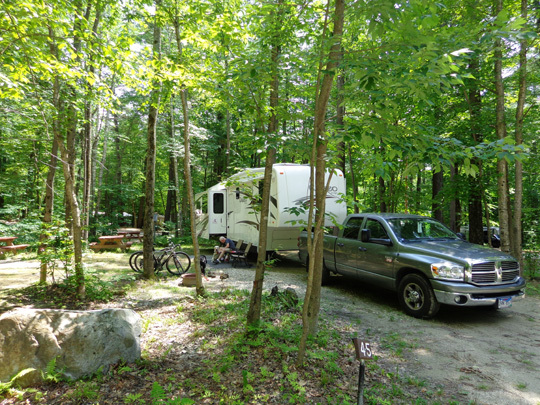 The campground is 80% full this weekend but the two sites closest to us are vacant, which is nice. Casey had fun retrieving the ball but she's still learning the best way to jump off the end of a pier. Campers enjoy swimming and boating in Windsor Lake. 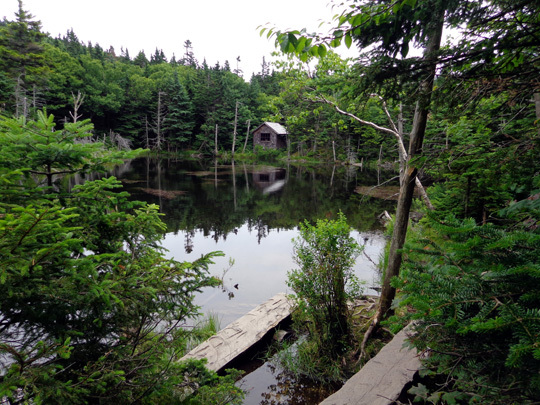 This seems like a pleasant place to spend the summer -- pretty lake, lots of activities, beautiful wooded sites, friendly folks. It's similar in some ways to Prospect Lake but we feel more comfortable here. 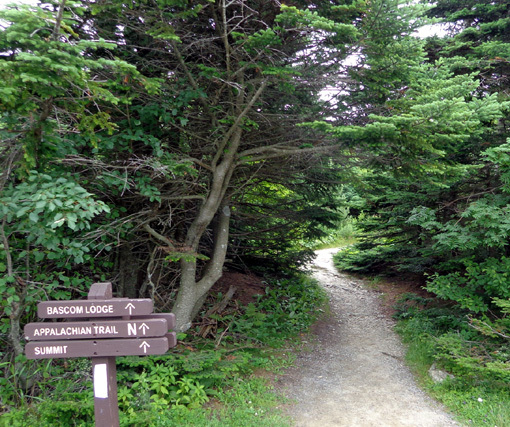 TO THE SUMMIT OF GREYLOCK ON THE A.T. 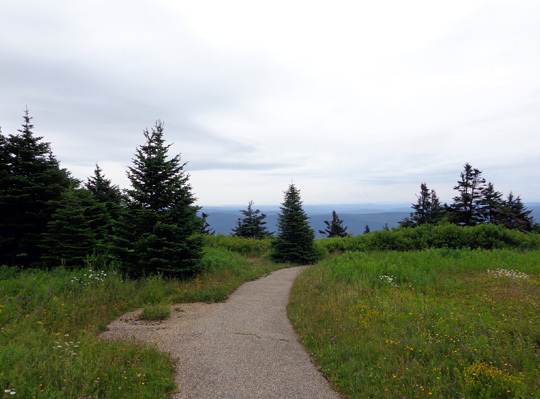 There are several trails hikers can use to reach the summit of Mount Greylock. They vary in distance, difficulty, and direction. 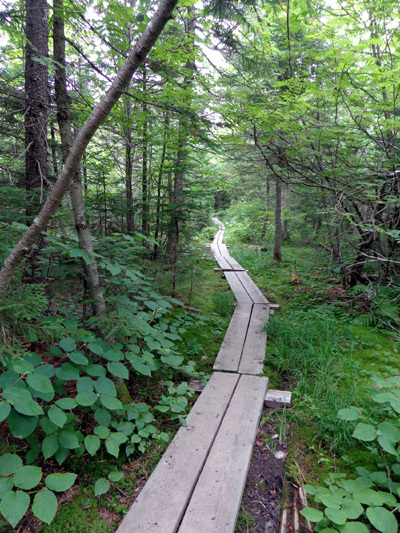 After studying the trail maps we got at the visitor center a few days ago I decided to hike the A.T. again. 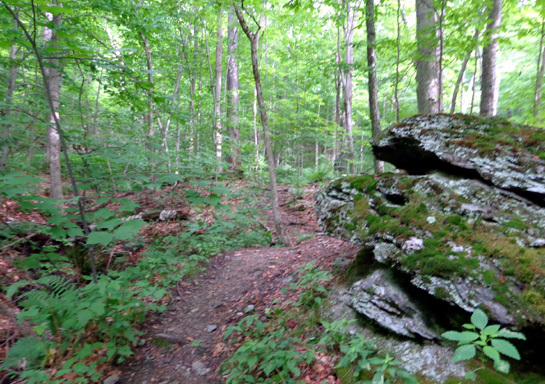 The Trail roughly parallels the scenic byway from south to north through the park and is about the same distance (11-12 miles). It crosses the road near the summit but isn't close to it on either side of the mountain. 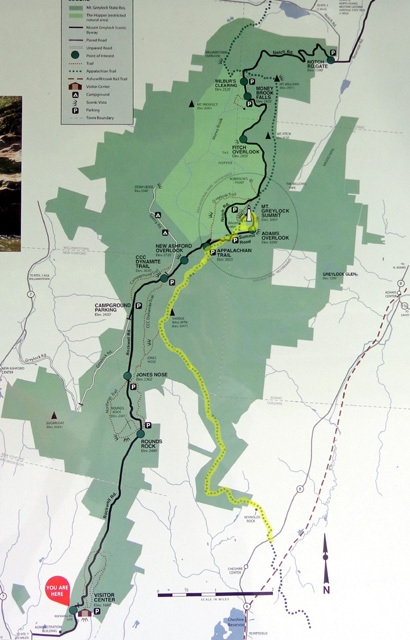 Map of Mount Greylock State Reservation; my route on the AT is in yellow. 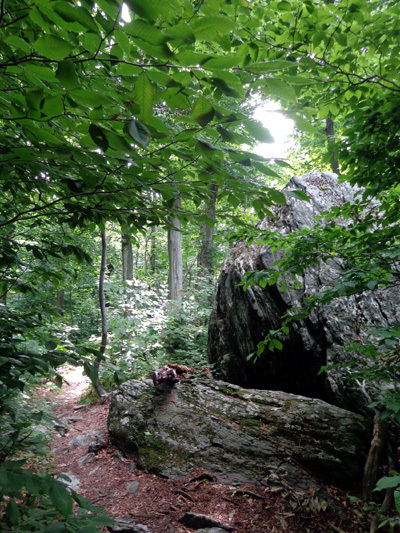 I re-read my journal entries from the '05 run/hike and was reminded of all the roots, rocks, and elevation gain and loss on the A.T. on this mountain. Since I can't run any more and I'm not in as good condition as I was nine years ago, we came up with a good plan that would allow Jim to ride his bike on the scenic byway and I could hike up the mountain for about seven miles with Casey. This morning we drove down to the town of Adams on US 8A and 8, then followed country roads to Outlook Ave., where the A.T. crosses. 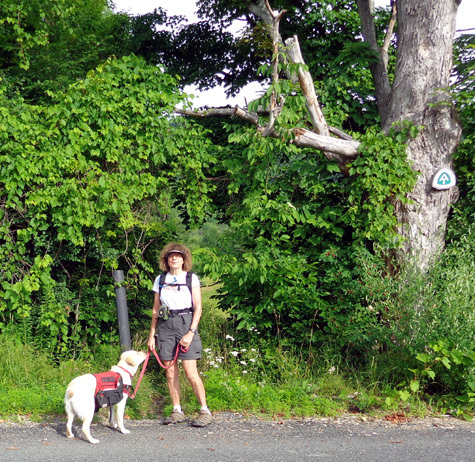 There isn't a trailhead parking area at this location but since it's a little road Jim just pulled over to the side while I put on my pack and got ready to hike with Casey. 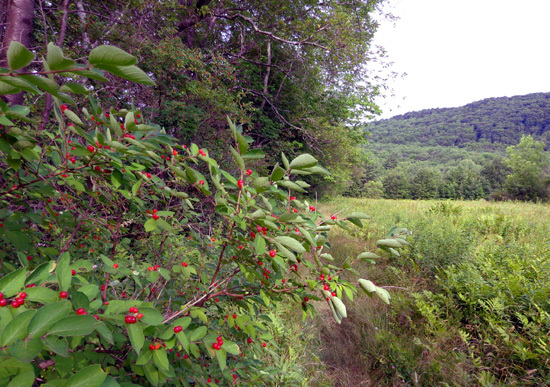 The A.T. goes alongside a couple of fields in the first half mile north of this trailhead. I followed the A.T. northbound for seven miles. The elevation ranged from about 1,300 feet to just under 3,500 feet and there was more descent on the way up than I remembered. There were more #!&*%$ rocks, roots, and mud than I remembered, too! 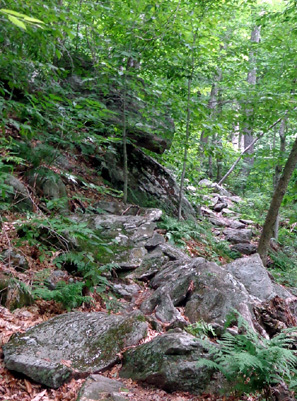 Some parts of the A.T. were fairly smooth (L) and some were very rocky (R). Meanwhile, Jim drove the truck to the summit of Mt. 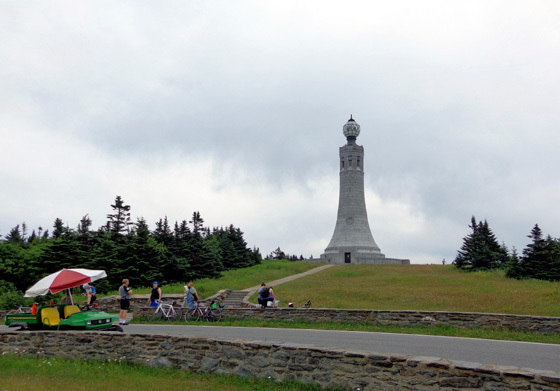 Greylock, paid the $4 non-resident fee to park it there, and rode his bike down the scenic byway on the north side of the mountain to N. Adams and our campground. Lots of folks rode their bikes UP the road, then back down. Jim didn't want to do the ascent but he did get plenty of uphill riding on the way back down to the campground. When I got done hiking I found the truck at the summit and drove it home. Our plan worked well. I started hiking about 8:30 AM and finished about 12:30 PM. I stopped to give Casey water and treats about every 45 minutes. 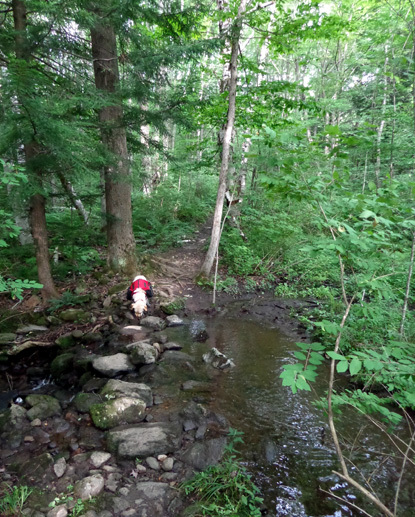 Even though we crossed two all-weather creeks and several dry creeks that were wet today, Casey hasn't learned to drink much water from streams. She's getting better at drinking from the plastic folding bowls I carry for her. I did better than I thought I would with the elevation gain, especially considering how many rocks and ledges I had to climb over. On the way up the mountain Casey and I met four runners and day hikers going downhill. A mile from the summit a male thru-hiker from Germany came up from behind. 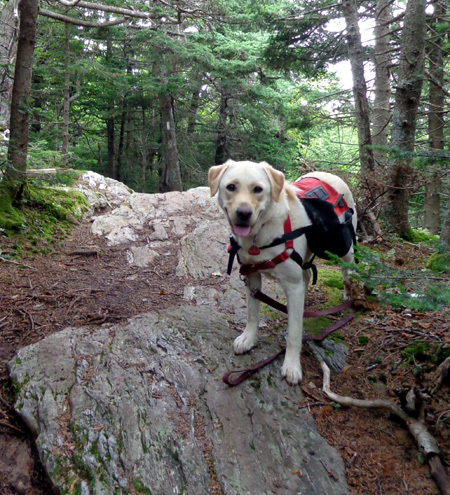 Since Casey is so exuberant when seeing other people on the trail I kept her on the leash most of the time. 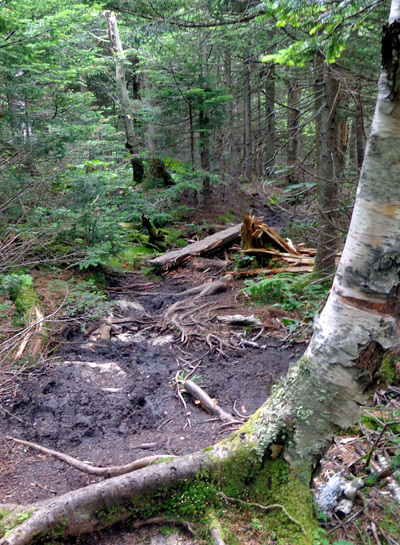 That works well uphill but not so well going down rocky or slick sections of trail. In the last mile closer to the summit I saw about 20 day hikers. Casey pulled and wanted to greet everyone except the last two women we saw near the top. She sat quietly to the side (finally!) and one woman commented, "What a good dog!" I about choked, remembering all the pulling she did all morning!! Casey patiently waits while I take her picture. 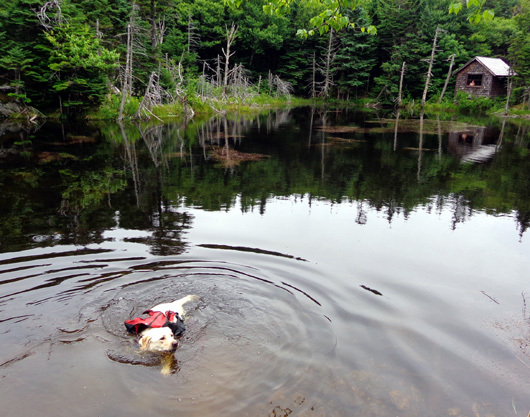 When we reached the little alpine pond about 1/2 mile from the summit I let Casey get in the water to swim. It was hard to keep her out. 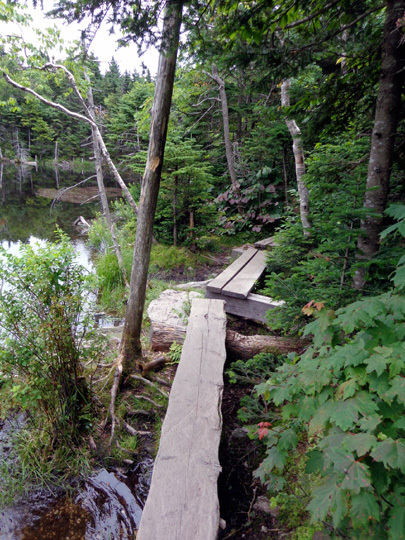 There were some people in the cabin across the water; the trail curves around to the left and goes near it but I didn't go down to it since the people were still there. 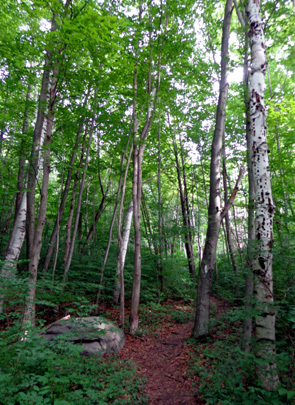 When we came out on the summit near Bascom Lodge I could smell hamburgers grilling. I don't eat burgers very often but they sure smelled good after hiking for four hours! 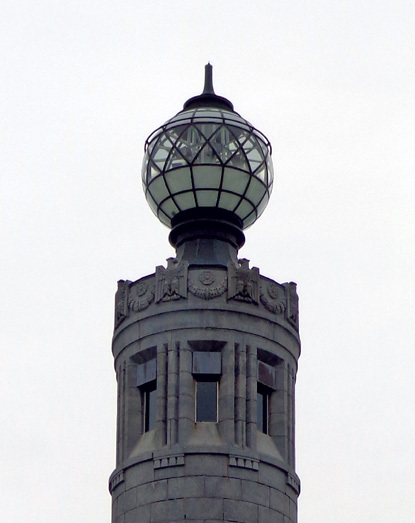 I wanted to climb up the steps inside the tower but it's closed for a couple of years for renovations. Phooey. Jim went into it in '05 while I was hiking but I was too tired at the end of that day to go in. It was cool enough in the truck to leave Casey there while I wandered around the summit for 15-20 minutes. The temperature at 3,491 feet was in the low 60s F. and there was some wind. I was comfortable hiking all morning in shorts and short sleeves. I went into Bascom Lodge for the first time. It's roomy but cozy and offers burgers, sandwiches, salads, and soup during the summer months. I had enough food to eat in the truck so I didn't buy anything. I wandered around the north and east sides of the broad summit to look down into the valley surrounding the small town of Adams. 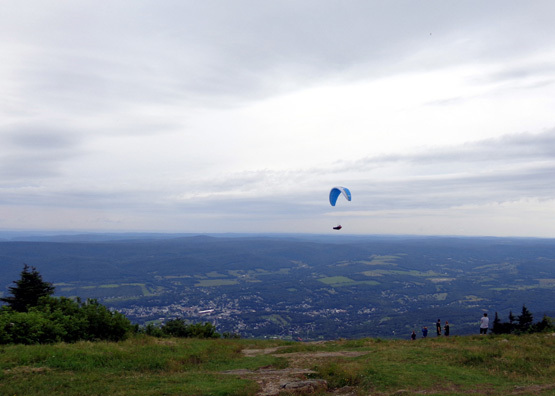 The skies were overcast enough that I couldn't get the views to the Green, White, and Adirondack mountains that visitors can see on clear days. 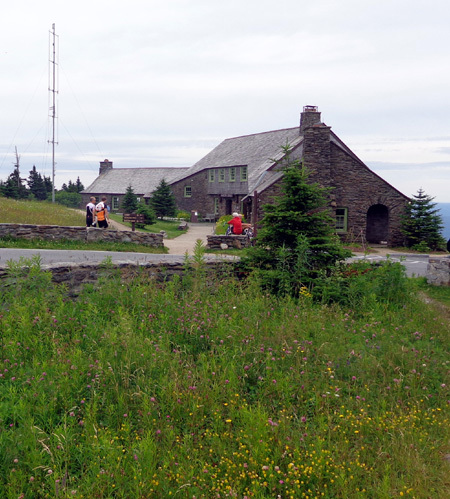 Despite the wind and clouds, about a hundred people were walking around the summit. Jim was already back at the camper when I got there early in the afternoon. It was fun comparing notes about our separate treks. Jim rode 15+ miles on his bike and I had 7+ miles of hiking.